What’s news? As every journalism student knows, it’s got to be timely, local, significant, celebrity-driven, or human-interest focused. Well, all that and more is now trumped by one additional qualification: video. If the recent Ray Rice case taught us anything, it’s that video, in all its grainy, security camera glory now trumps even the most classic definition of news. The Ray Rice story was dead in its tracks, until it came back to life, thanks to the security tapes from the now-defunct Revel Casino in Atlantic City. 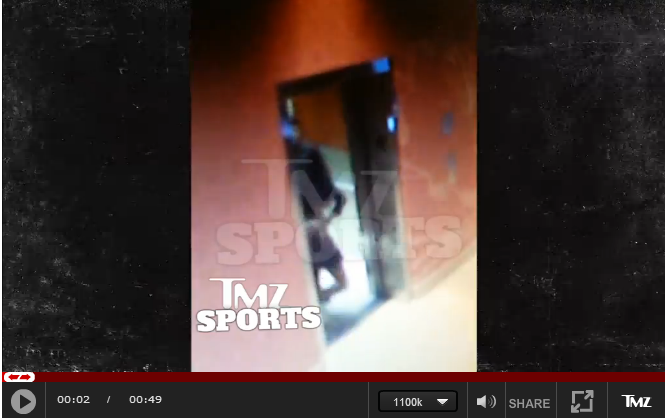 Rice had testified truthfully to team and league officials that he had struck his fiance, knocking her out in the elevator that night. It had all been reported. Heck, we all saw him drag her from the elevator. But it wasn’t until some former Revel security guard decided to hawk the video of the actual punch to TMZ, did the story turn Frankensteinian, life from non-life. With new video, a story once reported and cold as last weekend’s pizza quickly became the top sports story in the world. In that respect, the Ray Rice story will become known as a tipping point for news gathering, the singular incident that will forever change the definition of news. If it bleeds it leads. But if it moves, it grooves — and is worthy of 24/7 coverage. It’s enough to make NFL great Ray Lewis cry tears of joy that cell phone cameras weren’t around when he was implicated in killing two men at a 2000 Super Bowl party. Private indiscretions become fair game for political media coverage. Gary Hart was leading the presidential polls in 1988 until he challenged the media to follow him to prove he was no philanderer. They did, and caught him on board the aptly named boat, Monkey Business, entertaining Donna Rice. News blackouts during war become status quo. Up until the Gulf War, it was common practice for journalists to be embedded in combat. Think Dan Rather in Vietnam. But then came 1990, the Gulf War and the advent of the talking head war coverage. Even today in the era of social media, ISIS coverage is spoon-fed to an American audience seemingly unaware or disinterested in on-the-ground reporting that’s not first approved and sanitized by the US government. Sport as 24/7 news. It began in 1979 with the premier of ESPN’s Sports Center. Before that, no one ever realized that sport could support an around-the-clock gabfest. With it, came an entirely new definition of news as anything sports related. Digital journalists make mainstream news. Before 1998’s “Tailgate,” mainstream media never gave credence to a web reporting of news. Then, White House intern Monica Lewinsky confided to Linda Tripp that she was having an affair with President Bill Clinton. Tripp took the story to Fedora-wearing Matt Drudge, who broke the news on his website. News has never been the same. The death of the printing press. It ruled news distribution from when Guttenberg invented movable type in 1439 until the 1980s, when fledgling online news services, AOL and Prodigy, first began using pixels instead of paper. The 24-hour news channel. Props go to Ted Turner, who used junk bonds to expand his father’s billboard empire into TV, forever shortening the half-life of news, giving us OJ and spawning hundreds of imitators worldwide. India today has more than 80 news channels by one count. Secrets as news. Daniel Ellsberg’s Pentagon Papers might have been the precedent, but Julian Assange’s WikiLeaks is the first to formalize the way private secrets are published and made into public news. What about other instances when the notion of news has been forever changed? Let me know your thoughts in the comments below.